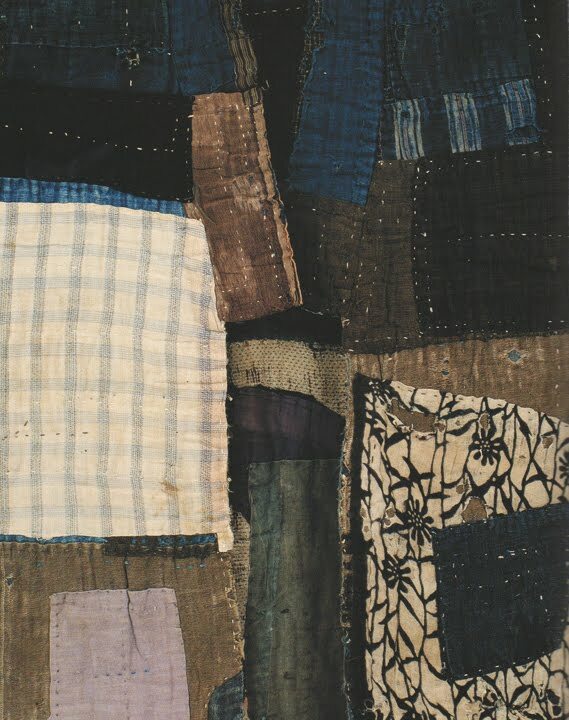 Boro is a Japanese word meaning "tattered rags" - used to describe patched clothes and bedding. Because the clothing has been patched over and over, they look like wearable quilts. For a long time they were an embarrassment, due to the extreme poverty of the country people who created them. Now they are considered National treasures. 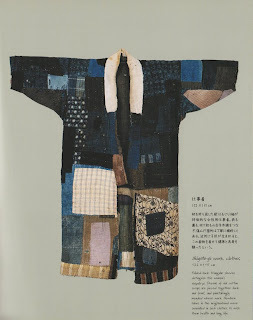 The book BORO: Rags and Tatters from the Far North of Japan by Yukiko Koida and Kyoichi Tsuzuki is based on the tireless search by Chuzaburo Tanaka for these cultural folk craft. 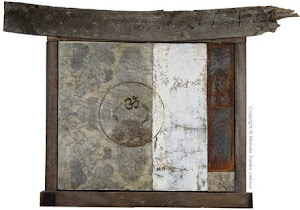 He trekked over mountains and seacoast for 40 years collecting these Boro pieces. 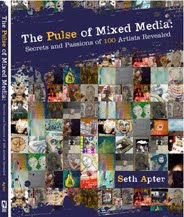 You can find this book for a reasonable price at the Trocadero website here. 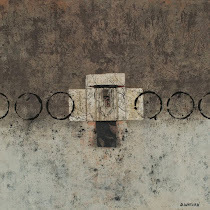 Without Tanaka's efforts we would never have known of the art and beauty of Boro. 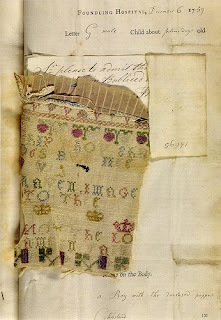 For the people who created them, each small scrap of cloth and thread was precious. 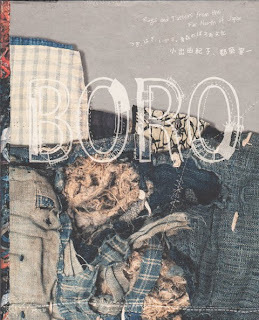 You can find actual Boro items at Kimono Boy, srithreads, and Shibui Home. 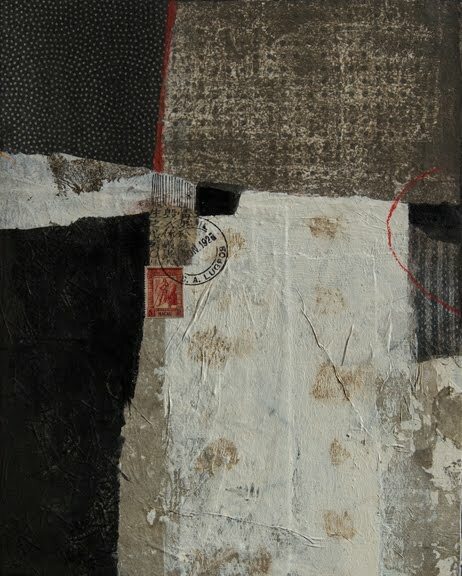 Below is one of my paintings in which I used hand-painted rice papers as collage. My hope in creating these hand painted papers was to make them resemble pieces of fabric in the style of Boro. 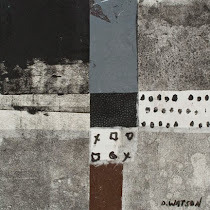 The title is Asian Quilt. Between 1741 and 1760, more than 4000 babies were left at the Foundling Hospital in London, England. When these impoverished mothers left their babies, they also left a small token, which was usually a piece of fabric. The fabric was either provided by the mother or cut from the child's clothing by nurses. 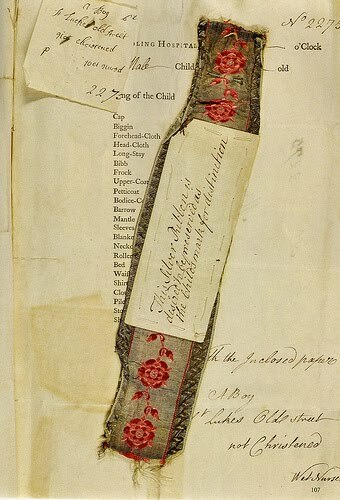 This piece of fabric was attached to registration forms and bound up in ledgers, in order to 'identify' the baby and keep identifying records. The hope by both the mothers and the nurses was that they would be able to reclaim their baby when their lives improved. These pieces of fabric represent the sad moments of parting. 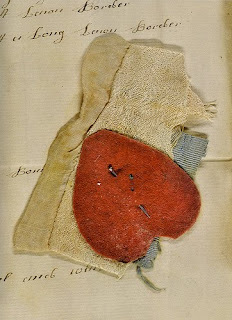 Below, the piece of fabric has been cut into the shape of a heart. These pieces of fabric also form the largest collection of every day textiles serving Britain from the 18th century. Earlier this year, the Foundling Museum in London showcased an exhibit called Threads of Feeling. You can find out more about this exhibit at the Foundling Museum website here. Between his age of 80 to 95, for 15 years until his death, Kouzaki Hiromu spent his days creating small simple 'works of paper'. When asked, he would say that he was making envelopes. 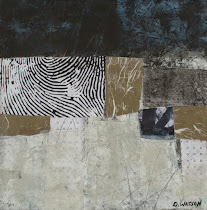 He cut up, folded and pasted pieces of found papers. In his work, Hiromu created simple edge, line and surface texture. Isn't it interesting how art imitates life, and life imitates art. 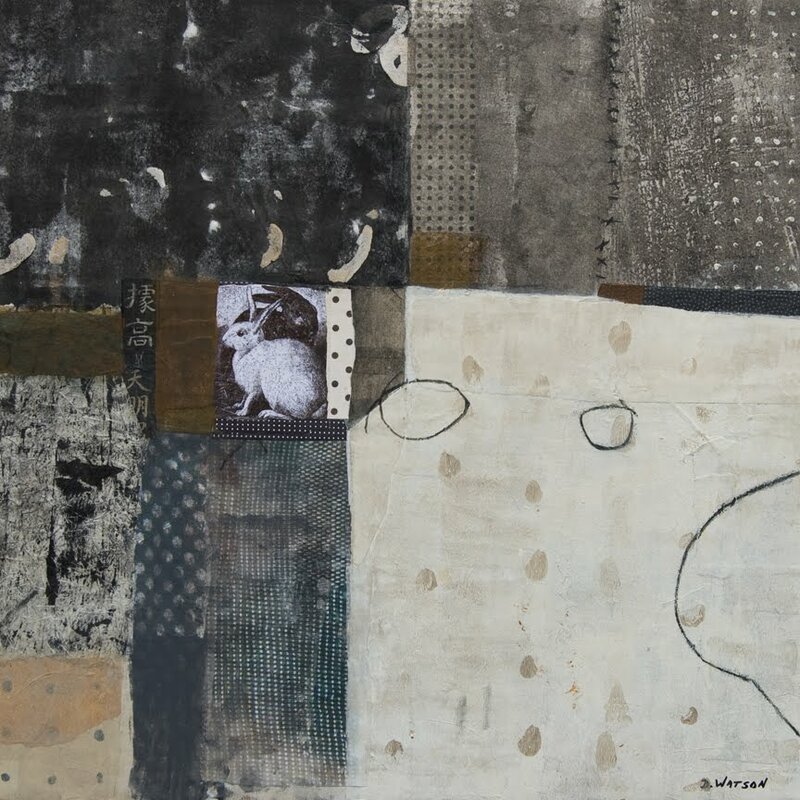 Over time, these objects today take on qualities of collage, objects of history, and objects with life and soul. 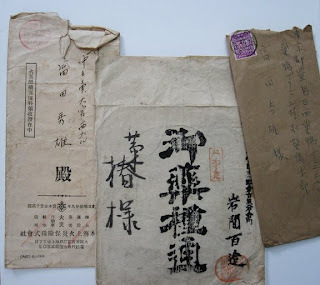 Envelopes I found at a temple flea market in Kyoto in 2009. Each of these three concepts of accidental or incidental art holds such power and simplicity, especially when viewed all these years later. 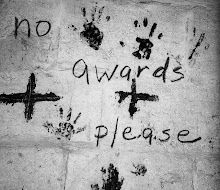 I wonder if we have such accidents of ritual favored now by some unknown group that will be discovered and revered many years from now. What a captivating and informative post, I'm fascinated by those London ledger pieces. I really like the point that Jackie has made. I lucked into a treasure trove of old Japanese business envelopes from a stamp show. Come to think of it maybe it was you that commented on them before. 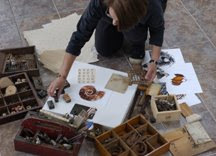 Anyway, thanks for your presentation on your blog here, It's inspiring me at this moment to do some sort of piecing of my many coveted components that I am hoarding! 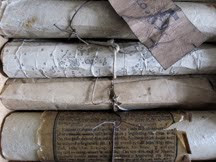 Those pieces from the London orphanage ledger are just heartbreaking. Thank you for this beautiful post, discussing the art of our everyday lives. Wow, this is such an inspiring post, and blog. Glad to have found you. Those envelopes are just beautiful. I have been collecting old envelopes for years for the infinite number of security patterns to be found on the inside. Put together they remind me of a Boro cloth. Threads of Feeling was such a moving exhibition wasn't it. Gosh Id gladly wear that Boro jacket today! Tho my kids would probably walk on the other side of the road to me lol..........but what the hell! 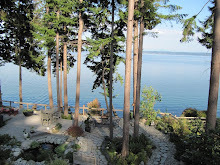 Donna, this lovely post reminds me that creative work is often private or virtually unknown. There's also something noble and trusting in work that seeks to hold life together or keep its dignity. all these books are with me (yes, i'm a book glutton) and go to them again and again for inspiration. a great story and wonderful new work from you! My great grandmother was adopted, but the records were forever lost when the orphanage burned down. The title Threads of Feeling speaks volumes. To have anything tangible to leave with one's baby...how touching. And those envelopes...thanks for the introductions Donna to these pieces of art and meaning. Your piece is a superb tribute to the idea and image of boro as a national treasure. this is such an interesting post, Donna. Being a former quilter and embroiderer I had heard of Boro. Didn't shishako develop from the stitches of boro? And the information about the foundlings is amazing. The bits of fabric are certainly the threads of connections. Been wanting this book for a long time! I love how you have translated the boro feel into paper. The foundling exhibit is so moving--I just hope some of the mothers were able to return for their children. I have seen "boro" pieces but didn't know they had a name. I love how they are like collage and I love your collage based on boro. Wonderful other tidbits too. Great envelope finds. A temple flea market! Sounds like fun. Donna, this is such an interesting and touching story. My heart skipped when I read about the fabric pieces the mothers left with their babies. I wonder how often they were reunited? 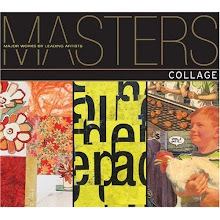 what a wonderful and heartbreaking collection of quilts and collages. The meaning beneath gives these (and your) artworks a special depth. Very moving indeed. ephemeral items. Things with history, things with a story..
A post I will return to. Thinking of those poor mothers who had to leave their babies.... Heartbreaking. I'm glad Kouzaki's granddaughter thought to create a book with his carefully crafted envelopes otherwise we would probably never have heard about them. Very touching. Your Boro inspired collages are beautiful Donna. donna, you know how I love the boro story and your collage is lovely. had read about the babies long ago. what a sad time. 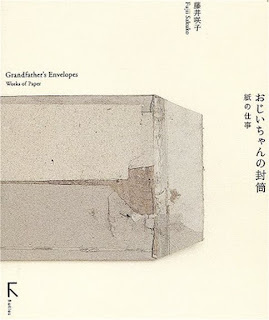 but the best is "grandfathers envelopes" love it! I'll be back to visit these pages again. 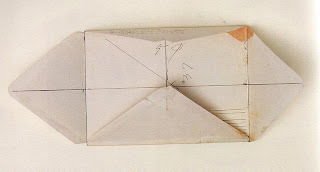 Those envelopes by Kouzaki Hiromu just touched my soul. They are so beautiful. Amazing how the Boro "rags and tatters" seem to carry the spiritual essence of their makers...they are so touching and exquisite. You succeeded in capturing the Boro spirit in your collage Donna, it is lovely. One can feel the spirituality in your work. 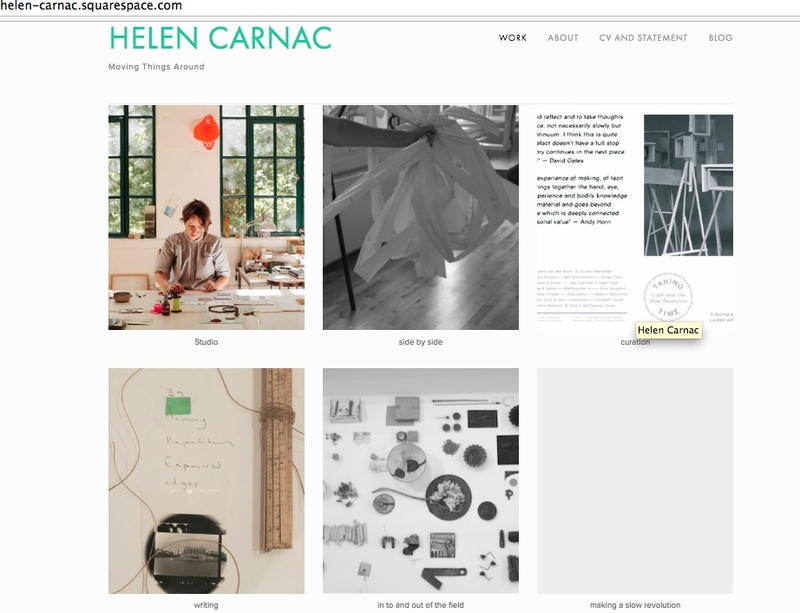 Your new blog design looks wonderful! I think these time-worn objects that speak about hardships are so touching because we think about the lives of those who suffered, those who loved. The boro pieces are a treasure; I'm glad someone took the trouble to preserve them. Your lovely collage does indeed resemble them. They remind me in some ways of the Appalachian quilts made by poor women from whatever little scraps they could find. The story of the fabric pieces given with the babies' identifying papers is so touching, and the exhibit must be heartbreaking; I had never heard about this before. And the envelopes, another container of memories... thank you for enlightening me. I am glad to have discovered your blog and this beautiful posting. Thanks. I love boro cloth and I love your work. Touching post. 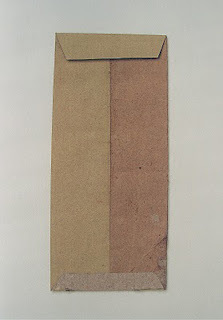 I'd also like to be "a fly on the wall" when you create your papers to resemble boro cloth! I have been reading layers for as long as l can remember but this piece really got to me. 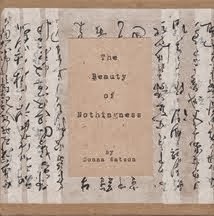 A beautiful piece of writing as well as Art. I visited the exhibition `Foundlings"..must admit l did loose a few tears. When l was a young teenager l worked as a Nursery Nurse in a Church of England Children's Home in York. Some of the children were left there while their foreign parents finished their education..but there were many different reasons. Donna thanks so much for this post, the words and works are so beautiful and touching and especially thanks for the books to add to my list. I've returned to this post a few times. So much to see and think about. And your paintings - so beautiful. The "Threads of Feeling" exhibition was an amazing, moving experience. I'm thankful for the opportunity to have seen it. Such a beautiful post! Thank you! 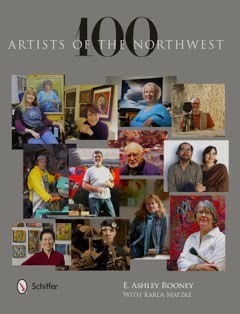 The concept of art created through chance is of great interest to me. I found the examples you presented here to be poignant and beautiful. What a fascinating post. I am going to follow your links to get more of the stories. Your collages here are sensational. Donna---you always post the most interesting things on your blog. I love learning about all these new things...things I have never heard of. I bought the book Etcetera based on a recommendation by you. I just might have to purchase this new one on Boro. How sad for the mothers. Was there any information regarding if any of them were reunited in the end? It's incredible how some fabric swatches can mean so much... makes my hair raise when I think. Your Boro collage is marvelous! Thank you so much for sharing these stories. I'll try if I can get the book here in Germany. Your work with the stamp is again very beautiful. Thank you for commenting on my post because this brought me to yours. Your compositions are absolutely beautiful. I see a sentimentality and calmness in the way you organize you materials. 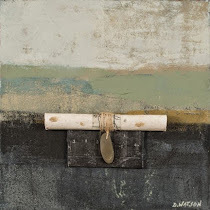 I love mixed media projects and your blog is an inspiration. I just found your blog post this morning as I was researching boro. Everything about the tattered, mended, quilted rags speaks to me. and now, finding out about the babies, their sad mothers, and the fabric scraps is just making my heart burst. Very inspiring post - thank you.